So cute and love your coloring. I love that image! It's so fun. 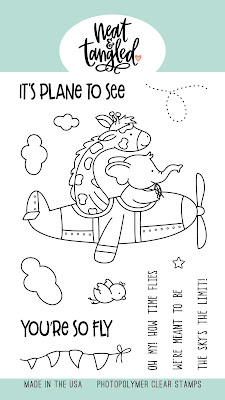 Plus, this stamp set is great for practicing coloring. How adorable! I love how the giraffe is leaning forward, into the wind. These guys are so sweet and cute...and the card can be sent for just about any reason. I'm totally in love with this stamp set! 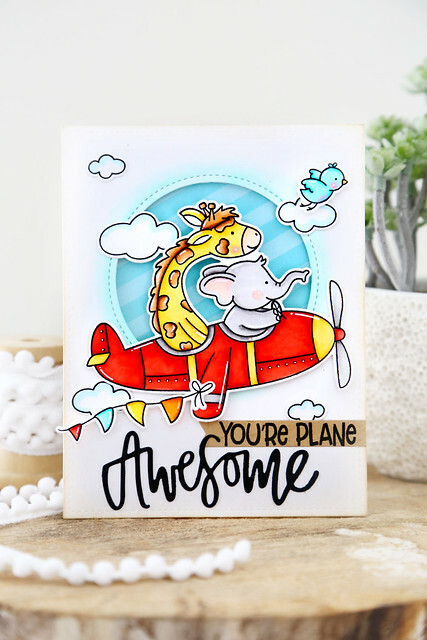 Awesome images and your card is so dang adorable! Love this card, the bird caught my eye! so super sweet - your coloring is fantastic! You've made flying fun! What a cute card. I love to use the circle die to create a sky. Your coloring is amazing. Great BRIGHT COLORS! I love the circle background and the sentiment! Love the card. I think it would also make a great Bon Voyage card. Thanks so much for sharing. The giraffe is my fave too! 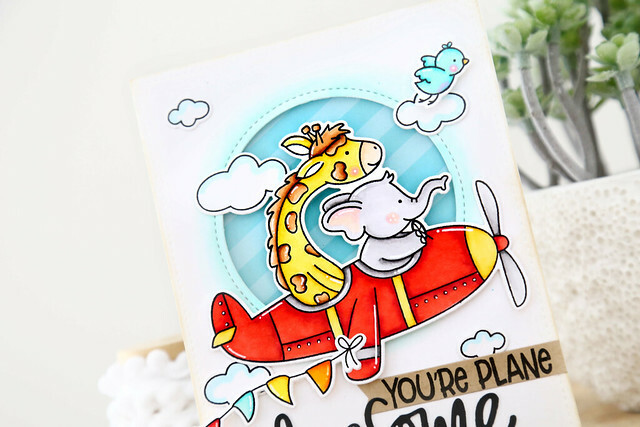 Love your card with the inset sky - just plane Awesome! This set is adorable!!! I love the fun sentiments! 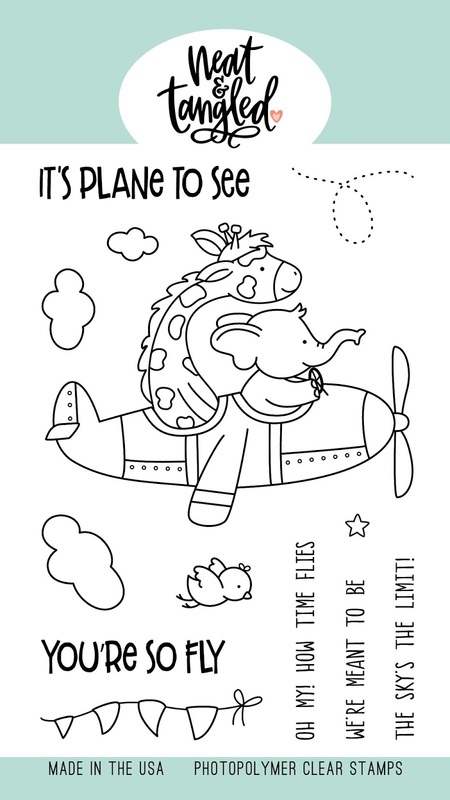 Your card is super cute; love how you attached the banner to the plane's wing; so fun! So dang cute!! I'm loving these critters and your card is just awesome! So cute! I love Beach Day and this is just as sweet! Oh my this is the cutest stamp set and your card is awesome. I like how you did the circle and sky behind. I love how you created your own sentiment and it's brilliant. Great look so sweet. Awww!!! I'm a big fan of your stamps because they're super super cute like this adorable one! This card is so sweet and fun!!! You are rockin' this set!! LOVED every piece you added! These two are so fun FLYING together!!! Fabulous set and card! Perfect coloring, birdie, banner and clouds!!!! Congrats on this darling set and adorable card. This is adorable. :) Such a cute stamp set! I love your critter sets, and this is no exception! Absolutely adorable! Love this stamp...as well as your fabulous card! Such a darling new set, Elena; congrats! Cute sentiments. So cute! What a great card Elena! So bright, cheerful and darn cute! Once again, you’ve designed such an adorable set !! Congratulations ! !